Our new custom ice pack! 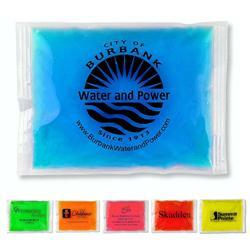 4" x 6" Blue "Stay-Soft" Cold/Hot /Therapy Gel Pack. Looks the same as our ice packs, but the compress gel pack will remain soft and flexible, even when frozen. Very unique and practical. Tie-in with community events, hospitals, health products, healthcare, fundraisers, tradeshow giveaways and schools. Use for hot or cold therapy, hospital promotions, chiropractic, massage therapy, sports therapy and physical therapy products. Choose color of gel – clear, blue, green, orange, pink, red and yellow. 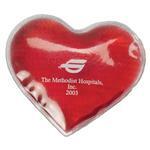 A great medical promotional item. Available Colors: Choose color of gel – clear, blue, green, orange, pink, red and yellow. Available Imprint Options: On Gel Pack. Pricing includes a black, blue or red surface imprint. Made in USA, Gel Pack, Hot Cold Therapy, gel pack will remain soft and flexible, even when frozen. Custom ice pack. Approximately 0.3 pounds per pack.